Your dental health is very important. We are committed to offering excellent value to our patients for the dental care that we provide. We understand that our patients need to make informed decisions about their dental health needs, treatment plans and the expenses related to the services proposed and rendered. Our Financial Coordinator will be available to meet with you to discuss your dental care financial investment and will answer your questions openly and honestly. We will respect your privacy and will work with you in a confidential manner. 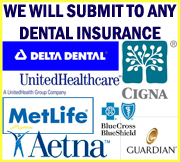 We offer a complimentary Benefits Review to all new patients who have dental care insurance. Many financial options are available such as no interest payment plans, American Express, MasterCard, VISA, Discover and CareCredit to enable you to get the dentistry that you need and want with our dentists in Nashua. You can now pay your bills online! For a complimentary benefits review, please call our office and ask to speak with our insurance coordinator at (603) 882-7312. Click here to apply for Care Credit online.